giving the cars a highly distinctive look. 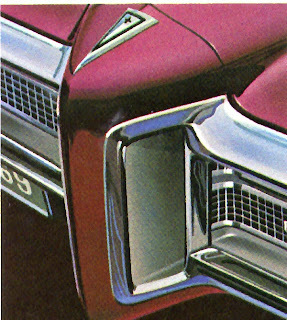 Long a favourite with buyers, Pontiacs appeared in showrooms from St. John's to Victoria wearing stylish new Wide-Track looks for the 1969 selling season. The whole tribe was given attractive nose jobs as stylists employed the latest technology to deck the design with an Endura colour-keyed centre bumper insert that most attractively split the new plastic grille in half. These fine road machines glittered in a dazzling array of 15 Magic-Mirror colours—a full dozen of them new this year. Pontiac’s pride was the Grande Parisienne line, consisting of a sassy Sport Coupe and a smooth Sport Sedan. Powering the new beauties was the 350-cubic inch V-8, an upgrade from the longstanding 327 cubes traditionally stuffed under the hoods. Billed as “Wide-Tracking with the luxury touch,” the Grande Parisienne was said to shout good taste and to whisper luxury. It was easy to remember one was riding in a Grande Parisienne; interiors were accented with a simulated walnut trim. Spotting a GP from the rear was easy, too. It was the car with the ultra-modern, colour-keyed plastic Endura insert running the length of the rear bumper. ordered with an extra-cost vinyl top. With its “strong masculine look of action,” the new fast and furious 2+2 series was unleashed. These were not to be trifled with. A Sport Sedan and a convertible comprised the line. Its list of standard features was longer than a country kilometre. Strato bucket seats were finished in a high grade of Parchment Vinyl, special wheel covers adorned the models, simulated louvres kissed the front of the rear wheel wells, colour-contrast racing stripes added their blessings and an embossed vinyl headliner were all bestowed upon the 2+2. fielded a Sport Coupe and a convertible in the 2+2 line. Optional equipment for the 2+2 was geared for performance. Variable ratio power steering gave 3.1 turns from lock to lock and power assist front disc brakes both made for some very exciting driving. Engine choices in the 2+2 gang were all V-8 and ranged from 350 cubic inches to a thundering 427 cubes. Power from the massive mills was mated to a buttery smooth four-speed manual transmission or the three-speed Turbo Hydra-Matic for shiftless driving. from other models in the family. The Parisienne family was by far the most popular with the public and buyers could choose among the Sport Coupe, Sport Sedan, a four-door sedan and a convertible. Cabins were finished in Reveille Cloth to give the look and feel of luxury car upholstery. The ragtop sported an all-vinyl interior. The base engine for the Parisienne was the 250-cubic inch powerful but ever so thrifty six-cylinder mill. With more than a million miles under its belt, the 150-horsepower engine was no slouch. 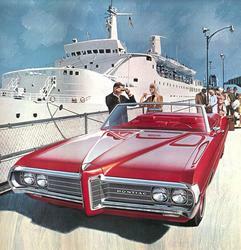 Pontiac engineers were so confident in its power that a Superlift towing package for trailers and boats was offered. A three-speed or four-speed manual gearbox was available to move the package along as well as GM's Turbo Hydra-Matic transmission. The venerable and vaunted Laurentian nameplate returned for its 16th season. Two value-packed offerings included a new Sport Coupe and the familiar four-door sedan. The Laurentian appealed to buyers who were seeking luxury on a shoestring budget. The least expensive Pontiac in 1969 was the Strato-Chief. A modestly dressed Sport Coupe and a four-door sedan were offered. 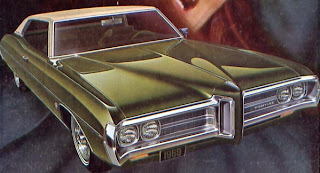 Billed as the “full-size car at the small car price,” Strato-Chief was the least expensive Pontiac on the showroom floor. Even here one could buy a Sport Sedan or a four-door sedan. Though more modestly appointed than its kin, the Strato-Chief had been recognized since 1958 for offering extras in the base price and this year they included such niceties as armrests fore and aft and carpeting. For those long family holidays back East, down East, wandering west or nosing north, Pontiac fielded four station wagons, all in the Safari line. The Number One Highway was just that much more attractive when graced with Pontiac wagons. Magic-Mirror colours for the 1969 Pontiac lineup included: Antique Gold, Burgundy, Cameo Ivory, Crystal Turquoise, Espresso Brown, Liberty Blue, Limelight Green, Maize, Matador Red, Palladium Silver, Starlight Black and Verdoro Green. If that wasn’t satisfactory, an assortment of vinyl tops could be had to dress up one’s car for a few more bucks. When the dust had finally cleared from 1969 the facts would show Pontiac able to hold onto its third place in sales for the calendar year. With 51,973 units delivered, sales placed it behind Chev and Ford. The Number Four spot belonged to West Germany’s Volkswagen. 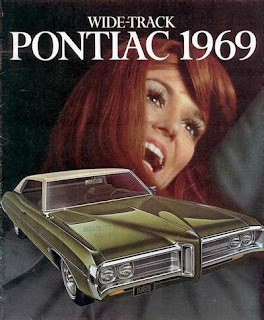 1969 was also the last year for the RHD on the B body Pontiac Parisienne and Chevrolet Impala built in Canada.The GM Port Elizabeth Plant in South Africa would also end its long run of building Pontiac;s in the 69 model year.The RHD Pontiac Parisienne used the 1969 rhd Chevy Impala dash board. Glenn Reid.